For example, here is what I said to Sean about our own wedding invitations: "I like turquoise. And maps. And this font." And here is what Sean, with these three relatively unhelpful pieces of guidance, managed to create. As far as the construction of these bad boys goes, they were pretty much as DIY as DIY gets. We bought square aqua pocketfolds from Paper And More and mounted the invitation on a dark gray square of card, which then sat inside the pocketfold on the left hand side. The RSVP envelope was dark gray (or "smoke") and matched the main envelope. One week in May, I killed a few evenings in front of Say Yes To The Dress and stuck a tiny doily inside each one of these RSVP envelopes. I cannot tell you why I did this; there was absolutely no need for it at all. But, what do you know, I was compelled to do it anyway. Speaking of going so far with the whole map/world/globe theme, we spent a long Sunday afternoon lining each of the main envelopes with vintage maps I bought on ebay. Again, I cannot tell you why I wanted to do this, just that I really, really wanted to do it. I swear, once this wedding is over, I'm going to take up scrapbooking or something. Maybe I'll turn a three-foot space in our 700-foot square apartment into a "craft corner," just like Tori Spelling's mom*, and spend all my spare time at Michael's. Oh wait, that seems to be my life already. Anyway, to seal the back of each of the envelopes, we ordered some gorgeous---and very reasonable---stickers made from vintage maps of Asia, Europe, and California from Etsy seller Bella Mercato. As you can tell, it was a whole bundle of laughs, sticking them onto 75 invitations. Look at me! I'm having a wild Friday night! Party at my house! You bring the prune juice and unsalted saltines, I'll provide the boring and repetitive activity! ....and mixed and matched a bunch of vintage stamps I'd bought on ebay with some of the United States Postal Service's more attractive modern numbers. By the way, I'm also going to take up stamp-collecting when the wedding's over, and I'm not even kidding. I've now become entirely and unashamedly fascinated with old stamps. Look! They don't make 'em like they used to! Anyway, for those of you who've asked to see our invitations, there they are in all their glory. More pictures are here, if you're interested. And for the other 90% of you who just want the wedding to be OVER ALREADY SO I CAN TALK ABOUT SOMETHING DIFFERENT, I can assure you that I know exactly how you feel. Why, when this wedding is done, I'm going to have hours and hours and hours to fill, hours I didn't even know I had. I shall have to take up hobbies in order to fill them! Scrapbooking and stamp-collecting will go part of the way to keep me busy, of course, but I may also need to look into fencing to kill some of this time I'll suddenly have at my disposal. Or model railway building. Or maybe Bunco. UPDATED TO ADD: Thank you so much for all the interest in our wedding invitations! We've been blown away by how kind people have been about them; I'm pretty sure we have Pinterest to thank for that. Unfortunately, we aren't professionals at this—we're just people day who got a kick out of making our own invitations for our own wedding, which was almost three years ago now—so we don't sell the template or take custom orders. But we ARE crazy flattered that you like them. Thank you! They look brilliant. Big cheer for Sean as well for presenting them so well to us all. I am in love. I'm now considering leaving the soon-to-be fiance, slipping into a low-cut dress and hitting up a graphic design convention. They're perfect! Way to go. Aren't you so happy you decided to DIY? Oh my, I am in love with all of that, and I mean ALL OF THAT! Oh my. i think i might be in love with that font. if i had a 'spare' £69 i would be purchasing that, just to write in everyday. I am consumed by equal parts envy and total admiration! They are beautiful and perfect, and so creative. I love them. Oh, Holly! How incredible! My eyes were just welling up at the sight of them. They are stunning and perfect. I hope our president appreciates his. We should see it framed right next to his seal when he gives his next fireside chat. And for the record, I'm going to miss the wedding updates. I'm living vicariously through you. i am a bit in awe. this is all extremely lovely. You have restored my faith in DIY. We have a friend who got married last month and she printed her invitations herself, and well, let's just say she should have married a graphic designer. Or at least aligned her print heads before she printed them. They're even more beautiful than I thought (and I was building them up pretty big in my head)! Your guests must feel very special - they make me feel special just looking at them. I think in your spare time you should go into the invitation creation business. A hobby with the possibility of income. ps - if this comment shows a lot it's because it keeps making me put in the "copy what you see" code. I am hardly ever getting it right and I double and triple check because my sanity is starting to go thanks to the code - ha. I love that you invited the Obamas. That made my morning. I hope they at least will send a gift! They look lovely, Holly. Well done, both of you! Okay, that font was born to showcase the phrase "See you in sunny California." Love. Is that your natural penmanship? (I don't like to brag, but in high school I was one of those girls with Cool Penmanship. And in college, I learned how to do that cool block-style printing that architects and interior designers and engineers are known for. I'm sure the fact that I brag about my handwriting tells you how exciting I was in high school.) If it is natural - HOW DID YOU LEARN TO DO THAT? I would gladly tune into to your blog for penmanship lessons and practice. I'm not entirely kidding. I'm sure this is rousing statement to how much I've grown, fun-wise, since high school. Now I kind of want to marry Sean. Oh, I love them! So fab! You have inspired me to think outside the box with doing our own invites. Neither of us are graphic designers, but my fiancee is a photographer and I am an interior designer, so creativity is not lacking. Oh the ideas I have now for her to take photos of things dear to us and use them as you used maps! Hope you don't mind if two girls in VA steal, umm...borrow...your ideas! They're absolutely stunning, Holly. You and Sean did such a great job of incorporating the theme, while keeping it a tempered mix of vintage and modern. Beautiful! I love them! And I really love the idea of having people suggest songs they would like to dance to - should make creating the playlist much easier. Amen to the graphic designer thing. I told my husband - "we got engaged in a forest so play that up! Make them look forest-y. And modern. A modern forest." That font is absolutely gorgeous. These are amazing and a delight. Those invites are gorgeous! I'm sure the Obama's will be showing up to your wedding - how do you turn down an invitation like that? Can I hire you and Sean to put together adoption announcements for us? Because seriously, this uber precious bull is not working for me. Beautiful. I love the font and the combintation of colours. We just celebrated our 5th anniversary and for about 3 of those 5 years since the wedding, I was still in 'wedding mode' - "Oooh, this would have been a great centerpiece/favor" etc. thankfully I"m over that now, but it was rather odd after having been in the wedding mindset for so long. Lovely! I think the white ink on the smoke envelopes is so elegant, and the stamp idea inspired! I got so absorbed in making our invites that I didn't think about stamps till it was time to send them, and the post office had just raised the rates. There was not a good stamp to be had. My hand calligraphed envelopes went out with a mish-mosh of basic stamps all up on. I should have played it up! WOWWWW! Your invitations are meticulously beautiful. Rest assured that all those hours of finger-aching work were totally worth it! The invitation sets the tone for the whole wedding, so you've definitely sparked your guests' excitement, no doubt! They look AWESOME! The font is fantastic. However, you misspelled "favour" and "honour". Aw, thanks so much, you guys. This is all Sean, though! I just offered input, he did the heavy lifting. Sarah, to answer your question, yes that's pretty much my normal handwriting. I fancied it up a little here and there (and having a good pen helped), but I like to think I've been practicing it for all those years in order to FINALLY have a use for it. Wasn't so effective on exam papers or filling out forms at the doctor's office. I love that you invited the Obamas! These are gorgeous! I love every part of them, especially all the details! You done good! Both you and Sean! I think you need a side business! I've been so excited to see these and they totally exceeded my expectations. I knew they would be cute, but these are amazing. I love all the details - the doilies and maps in the envelopes, especially. I really love the font too - very whimsical. I'm getting married next year and I don't think any invitation I make or buy could live up to those!! Well done!! And thank you so much for posting the pictures. I love them, Holly. They are so perfect. We are planning to use the pocket style ones aswell, I really like that sort of invitation. Hey, maybe you'll get a cool gift from the Obama's...with your tax dollars of course. They are lovely though, you did a great job! Oh my, really and truly those are the loveliest invitations I've ever seen. (The last one I received was an Evite. Please.) Every detail—from font to stamps—is perfect. And I completely did an LOL when I saw the Obama invite. If they come (and I have to assume they're smart enough to attend), where will you seat them? I've been lurking for a couple of months and just wanted to say I LOVE your wedding updates. I'm getting married in October - it will be a very small immediate family-only event which has our friends pissed off, but will make us happy as clams. So in a very strange way, I've loved seeing all your wedding fabulousness and couldn't be happier for how great its turning out for you. At the same time, I'm super happy I'm not the one gluing tiny doilies into envelopes. LOL! A hearty and early Congratulations to ya! These are gorgeous! I love maps and globes and anything travel-related too, so I'm pretty much swooning over these. Props to you and Sean for your design and craft skills! If I had married a graphic designer and/or if either of us were creative AT ALL, I totally would have gone the DIY route. Alas, neither of us are graphic designers or creative, so we had to pay an arm and a leg for our invitations. However, they were awesome, so I can't complain. P.S. I made sure to memorialize them forever by scanning an invitation and making it the first page of our guest book and you better believe I still look at it and admire it every so often. Looking at how you addressed the envelopes reminded me of how much research I put into addressing my invitations properly. I would ask my fiance questions, such as, "Well, does your cousin live with his girlfriend or not? Because if he does, then her name needs to be listed first. Yes. I know HE'S your cousin, but it's proper etiquette for the girlfriend's name to be first." Or, "I don't care if your uncle will think it's weird that I'm listing his wife's name first, that is PROPER ETIQUETTE." Or, "How should I address the invitation to your aunt who has her PHd? Doctor? Dr.? Yes, it matters, she went to school for 5 years for that!" In the end, only about five of his THIRTY SOME-ODD relatives even RSVPd AT ALL (ARGH), so I suppose it was all for nothing. WOW. These are fabulous, Holly! If the invites alone are this impressive, I cannot wait to see how the rest of your wedding turns out! Love the Tori Spelling Mom Gift Wrapping shout out. I was fascinated by that. I believe I saw it on people.com. But anyway, I LOVE your invitations. They came out beautifully. wow, Holly, these are gorgeous! I love all things stationery-esque and will definitely take your bit of advice re: marrying a graphic designer into serious consideration...! You've made it ridiculously hard for President Obama to even think of declining. I want to wallpaper our house with your invites. Amazing job!! Was it easy to line the envelopes? They are so gorgeous I can hardly even stand it. I reckon Sean just inadvertently got himself into the wedding invitation business. Oh, these are so beautiful! You and Sean should totally start an invitation business - just beautiful. I never in a million years would have thought about inviting President and Mrs. Obama - so cool!. Is that something people do, or did you guys just do it for fun and wishful thinking? These are soooo beautiful and creative! And I love the collage of how you portrayed them here. I can tell a lot of time went into it all. Congratulations!! I have to agree! My (now) husband is design inclined and it made SO many aspects of planning our wedding that much easier! From gorgeous invites to place settings and orders of service! And I LOVE yours. 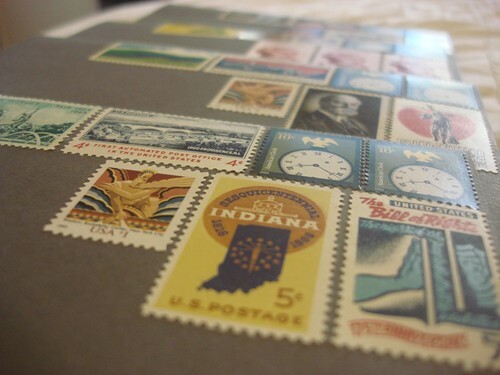 The vintage stamps are totally gorgeous. Those are without a doubt the most beautiful invitations I have ever seen. You guys rock! can i just ask which font you used here. i managed to find the veer feel script, but it is more scripty than the one you have used. has it just been adapted? my friends having a tattoo and she has now decided thats the font she has to have! They turned out just beautiful..
(Who also reads your blog & is getting married) doesn't get any bright ideas from this...ugh !!! So glad your Mum found a dress !! Echoing the others: by far the most beautiful invitations I have ever seen. Seriously. I also adore that you invited Barack and Michelle- I wanted to but felt a bit silly- now I wish I had! Your wedding is going to be phenomenal. Wow. Seriously gorgeous. Seriously creative. I'm totally jealous. Woot woot! We got a shout-out! I am sure that Leah has told you that the ONLY reason we haven't sent back our attendee card is that she can't bear to not hold onto it. She says it's because she has to photograph it, but I know her well enough to assure you that she just can't bear to break up the package. We will will WILL be there, however. When doing your lists and seating and whatnot, you may just have to use a 3x5 card for us instead of the card that matches all the others. We had an iTunes reception, and had no idea that there was a name for that sort of thing. I love the invites. So wonderful in every possible way. Good job, Holly. I LOVE them! Love, love, love! Goddamn, those are a thing of beauty. I did a LOT of things for no reason other than "I feel compelled to do this". Most of these things involved color-coded spreadsheets. Paris Gellar (Gilmore Girls) had a craft corner! These are just so beautiful. I can't wait for the reveal of the actual wedding details! The invitations are lovely. Good on you both! um these are amazing invites! i only hope i can be so crafty when i start planning my wedding and send mine out. so fun! I've been around a lot of printed items (I'm being vaguely vague on purpose, my apologies), and these are some of the most unique, stylish, thoughtful, and quite simply, beautiful collection of bridal items I've seen. Take my word, that is quite an accomplishment, and I hope your recipients treasure the love with which each invite was crafted - to know that they were special enough to merit this amount of thought to detail and the time you invested is quite touching. Best wishes for a beautiful and memorable day surrounded by the people worthy of this endeavor! Those look FANTASTIC! 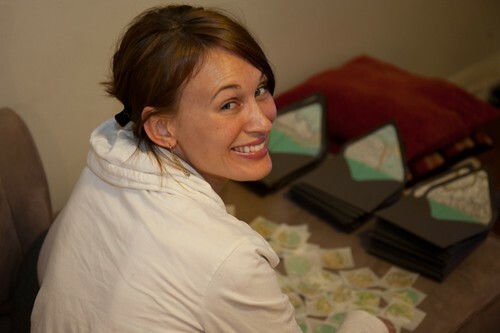 Did you make an extra to put in a wedding album? We did, but then we had to send it to someone! Whoops. Those are gorgeous. How very clever of you to marry a graphic designer. I married a photographer so as to have art for the walls, which was good, but I must admit your invitations are much, much cooler than ours were. I love these invitations, especially as you included a pocket for all the loose slips of paper to go in. The amount of invitations we've had where everything falls to the floor as soon as you open the card! The equivalent in this country of inviting the President would be sending an invitation to Gordon Brown, and quite frankly, there is no way I would want him showing up at my wedding. Obama is much cooler. Although, Helen, you can also invite the Queen! We're going to do that too. You have to be a UK citizen and apparently she sends back a very nice card. Is this 20% discount still available? It would be SO wonderful if it was!! Please let me know! okay, i just peed in my pants a little bit. where was all this cool stuff (ie ideas, aka inspiration) when i was getting married?!!? also, what in the WORLD is that font?! it's dreamy! and lastly, where can i learn to print like you? The Queen and Obama? You've got the best of both worlds! I need to marry an American (as well as a graphic designer). oooh la la. be still my heart. you've done all of my favorite things. maps. check. fancy fonts & killer design. check. darling envelope liners. check. handprinted envelopes. check. vintage array of stamps. check. am in la la la love with these invitations. doomsday to whomever dares to throw one away. hopefully you don't have any guests who'd think of such a thing. best wishes on your big day. I was thinking of getting engaged to a graphic designer and after getting the wedding invitations done up, I'll dump him for either the stockbroker who might make me rich or a doctor who might treat me to a little free liposuction now and then. Both of both worlds. Hooray! Oh wait, I realised I could have just paid for the invitations or lipo without breaking anyone's heart. Now, why hasn't that stockbroker I met last night at the bar called yet? I LOVE these invitations, and am OBSESSED with feel script! Also, would you mind telling me what font the other (the plain font in all caps) font is? I love these! Using a bunch of stamps was a great idea. I think the doileys were a stroke of genius. These invitations are seriously gorgeous! Hi there may I know where you bought the doily liners? LOVEE these!! i am obsessed with maps and am likin the theme idea. how else did you carry it throughout your wedding/reception? was your main color similar or the same as the teal folder? I think im pretty crafty and hope i can create some invitations that compare to yours!!! LOVEE these!! i am obsessed with maps and am likin the theme idea. These invites are absolutely brilliant. My theme is vintage maps and my colors are aquas, pinks and peaches. I am using your design as an inspiration piece. I truly hope you don't mind! Everything in your wedding photos looked wonderful!! Congratulations on a job well done! These are absolutely gorgeous. Where did you get the invitations printed? Where did you get the invitations printed? Is that...letterpress that I see?! Did you do the custom cutting across the invitation mat yourself (around your parents' names)? TIA! Beautiful invites! What did you use to adhere the maps to the inset of the envelope? Love this!! This is inspiring for my own wedding!